Cortijo Amaya is located on the Costa del Sol, in Torrox-Costa. 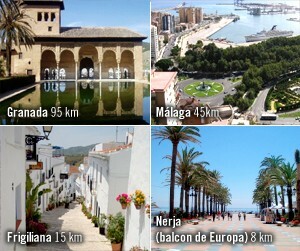 Did you know that Torrox-Costa has the best climate in Europe? Research revealed that Torrox is the place in the Mediterranean where the average tourist would feel most comfortable, due to it’s mild climate year round. Whatever you are looking for: peace, culture, socializing, action – you’ll find it here. Want to relax? In our B&B you can relax all day in peace and privacy, with a drink. Do you prefer the hustle and bustle? Cortijo Amaya is ideally situated, only fifteen minutes walk away from the lively promenade of Torrox-Costa, with its sandy beaches, many restaurants and cafes. The coastal town of Nerja with the famous ‘Balcon de Europa’ is just eight kilometers from the Cortijo. Also easily accessible are the magnificent Moorish cities of Granada, Cordoba and Seville: cities for the real culture lovers! In the beautiful surroundings you can enjoy cycling, hiking, horse riding or go on any outdoor adventure. Or spoil yourself by booking a half day trip on a catamaran to go sailing and dolphin spotting. Alternatively, rent a scooter and ride along the magnificent coast road towards Almuñécar, where you can find many small, secluded beaches. 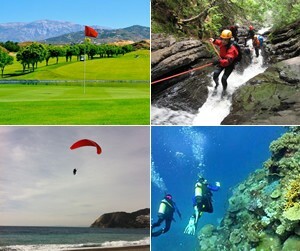 There are also a wide range of water sports: sailing, diving, canoeing… to name just a few. Need help making plans? We are happy to organize a special day for you in the area. For the children we have an indoor games room. Moreover, the children can play football or basketball on the tennis court. And in Almuñécar, a twenty minute drive, is a large water park: Aqua Tropic, open from June to September. About ten minutes drive from Cortijo Amaya is the beautiful 18 hole golf course Baviera Golf, which is open the whole year around. In the winter months you can even go skiing! Skiing in the Sierra Nevada is possible from November to April, and you can reach the slopes in just a 1,5 hours drive from Cortijo Amaya. Cortijo Amaya is the right place to offer a fantastic holiday for everyone, all year round!